After a disastrous reveal stream, Gearbox has finally, officially, revealed Borderlands 3. 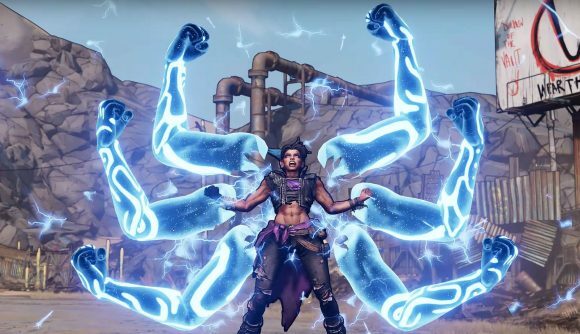 Along with a suite of other announcements, CEO Randy Pitchford showed off the game, which he says his team has been working on for five years, at Gearbox’s PAX East showcase. Details, sadly, are a little hard to come by, but you can check out the reveal trailer further down this article. What we do at least know is that much of the information gleaned in yesterday’s Mask of Mayhem teaser trailer will find its way into the game, as the new video showed off new and returning characters, including the new vault hunters, antagonists, and returning favourites including Lilith, Claptrap, and a grown-up version of Tiny Tina. There’s also a new look at the game world, which is looking far more diverse than usual, lending credence to claims that it won’t take place solely on Pandora, but there’s no word about combat, beyond the suggestion that loot fans are going to be extremely well catered to in Borderlands 3. That’s primarily down to the claim that Borderlands 3 will feature one billion guns. Adorably, that’ll include at least one weapon seemingly inspired by the folks at Boston Dynamics, which is capable of wandering into battle under its own power. Beyond that, however, there’s barely any more information, let alone word on the Borderlands 3 release date, or Epic Games store exclusivity. On that front, you’ll probably have to wait until next week, as Gearbox say they have more news set to arrive on April 3.